The desire to build together a community of life. Father General has called on us all to redouble our efforts to welcome those who suffer because of the need to migrate and to work together to build ‘a community of life’. 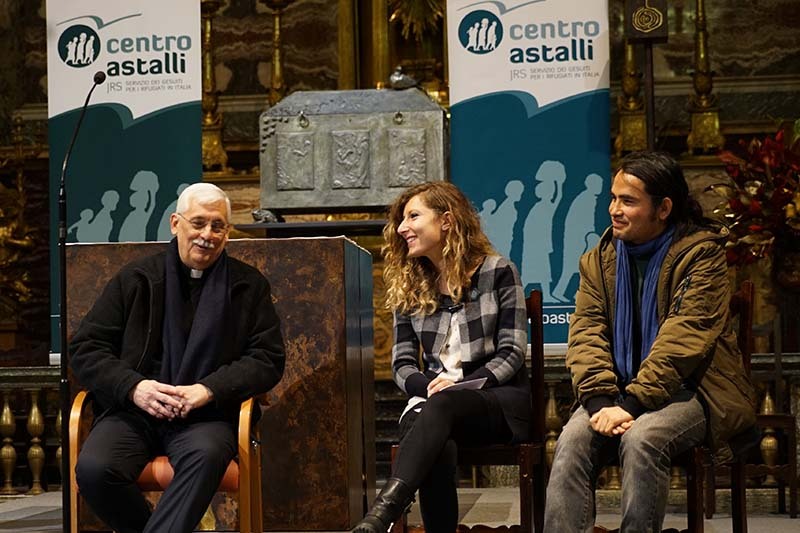 Speaking in Rome before the World Day of Refugees and Migrants (Sunday), Fr Arturo Sosa SJ was addressing refugees, volunteers and staff from the Centro Astalli, the headquarters of the Jesuit Refugee Service in Italy. He urged all who support refugees and migrants to put pressure on governments, especially in Europe, to create channels that will give safe and legal access to children and adolescents forced to abandon their homes, their countries and often even their families, in order that they can make a future elsewhere. At the meeting at the Church of Gesù in Rome on Friday, Fr General said he was both happy and moved to have been able to listen to refugees’ testimonies and to share reflection and prayer with them. “This moment presents an important invitation to the Society of Jesus to accompany, with its few resources, and to share in the anxieties and hopes of the refugees here in Italy and everywhere in the world,” he said. Fr General was greeted at the Gesù by Fr Camillo Ripamonti SJ, the President of the Centro Astalli, who reminded those gathered that the message of Pope Francis for this day focuses this year on child migrants. “The Pope points out that among migrants, the children are the most vulnerable group,” he said, “because … they are invisible and voiceless. And this reminds us of the need to protect them, to integrate them, and for them to be able to look to the future. Yes, dear Father Arturo, yet we continue to ignore this responsibility. We have not protected them; we have allowed them to die by their hundreds in the sea on long and dangerous crossings in the Mediterranean; and many of those who came got lost (in the) news, perhaps, and (have become) prisoners or victims of trafficking. But not only that: we are not even integrating as we should those who live with us.” He appealed for action at the international level, to work for the resolution of conflicts and serious investments in the development of the many young foreigners who need reasons for hope and seeds for a future of peace and reconciliation. During the public event, ‘Refugee Youth: hope for a future of peace’, 20 refugees and migrants of various nationalities delivered a message of peace for the world that they had formulated in their original languages. Five boys and girls who had arrived in Italy as minors fleeing from Guinea, Afghanistan, Albania, Syria and Ethiopia shared their testimonies. And Fr General Arturo Sosa SJ was presented by refugees with an icon. Entitled 'foreigners and itinerant men', it depicts the three kings, the Magi who followed the star in search of the baby Jesus. Fr General's address at the meeting 'Refugee Youth: hope for a future of peace' is available on the website of the Jesuit Curia in Rome. You can read more on the JRS website and more photos is available on the Centro Astalli website.